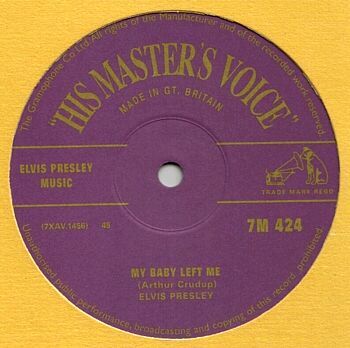 Elvis' earliest UK releases were on the EMI label 'His Masters Voice'. 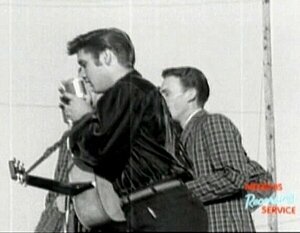 It was only after 'All Shook Up' that RCA started releasing Elvis material on their own label. These early HMV Elvis releases are very rare and there is something extremely appealing about their purple and gold labels. Owning an HMV original is a real treat for Elvis collectors. In a very smart marketing move (Making the most of the 50-year Public Domain ruling) the M.R.S label has released another 'His Masters Voice' collectable, in collaboration with HMV UK stores. Released on August 20th on both 10" vinyl and enhanced CD, this collector's HMV version of 'My Baby Left Me'/'One Sided Love Affair' is a real pleasure. What impresses most is the care with the artwork and presentation. The vinyl single has a beautifully authentic label (see above), while the CD single is printed with onto a black vinyl look. Not only that but it features a double cardboard sleeve plus a shrink-wrap so that the sticker doesn't ruin the front cover. It looks very stylish, if only BMG took the same amount of care with their releases. If you play the CD single on your P/C it is also enhanced with a bonus quicktime video version of Elvis singing 'Don't Be Cruel' live in Tupelo from the 26th Sept 1956 homecoming. The video has been taken from the recent 'Tupelo's Own' DVD and is a very clever promotional piece, especially if you haven't seen film of Elvis live on stage in 1956. This is a cute bonus and the menu itself is a very nice design. While I do not know where M.R.S. obtained the master tape from, the sound is not the same as Kevan Budd's fine audio work on his FTD release. The audio however is very good quality and I am guessing that the songs came from the 1956 RCA Studio safety recording that I recall once being sold by a Canadian(?) collector. Of course these are mono tapes so the audio difference has to be in the tape generation as well as the audio processing. 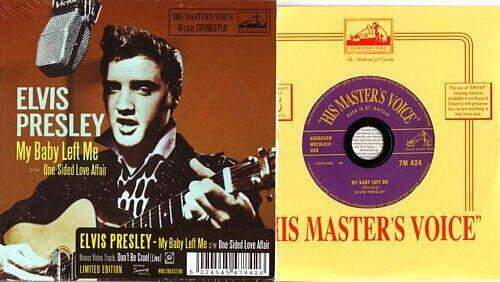 On 'My Baby Left Me' this HMV version has Elvis' vocal more prominent while Kevan Budd's version has a richer, cleaner bass. 'One Sided Love Affair' again has a higher Elvis vocal with less of a high-frequency end. The vinyl B-side features the sublime 'One Sided Love Affair' as well as the bonus of Elvis singing 'Don't Be Cruel' live on stage in Tupelo. Unfortunately the distortion of the old concert recording somewhat grates after the smooth perfection of the earlier studio Master and I personally would have preferred the single without the extra track. However I am a vinyl collector and this will be regularly spinning on my turntable. The CD was mastered and authored by Mick Ritchie, the compilation was produced by Joseph Pirzada and co-produced by Joe A Tunzi. Verdict: If you are an Elvis collector I can highly recommend both, a sweet treat at a very reasonable price. Available in the UK from HMV stores - but you can also buy it on-line here. EIN review - "Memphis Recording Service Vol.2 - 1955 The Rise Of Elvis Presley"
EIN review - "Elvis Presley Memphis Recording Service Volume 1 1953-1954: The Beginning of Elvis Presley - The Birth of Rock 'n' Roll "
EIN Elvis Week Exclusive report.